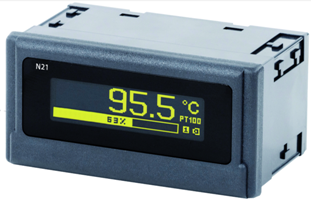 London Electronics have just released a new compact, low cost, and easy to use panel meter, which can be configured with a USB connection. Being graphical, it allows you to create a digital and bar graph representation of your measurement. The front panel is a sealed IP65 making it ideal for installation in wet areas. All configuration settings can be saved to a file, which also stores the meters serial number, which is ideal for QA traceability. The Model N21 accepts 24V DC, 24V AC, 110V AC or 230V AC power as standard and has the capability to give a 24V DC output at up to 30mA to power your 4-20mA loop. A configurable alarm relay is also provided and the N21 can customise the units of measure to suit your requirements. The input signal can be averaged over a chosen timespan from 0.5 to 20 seconds. The alarm relay is rated 250V AC 0.5A Resistive load. It can have a programmable delay from 0 to 3600 seconds to prevent nuisance alarming caused by short term variations.